Vital records of Brookfield, Massachusetts : to the end of the year 1849, , at https://archive.org/details/vitalrecordsofbr00broo . Worcester, Massachusetts: Franklin P. Rice, (1909) , p. 57. Seth C. Cary, John Cary, the Plymouth Pilgrim (n.p. : Seth C. Cary, Dorchester Center, Boston, MA, 1911, unknown publish date), p. 128, sec. 72. Seth C. Cary, John Cary, the Plymouth Pilgrim, p. 182, sec. 144. 1880 United States. Census Office. 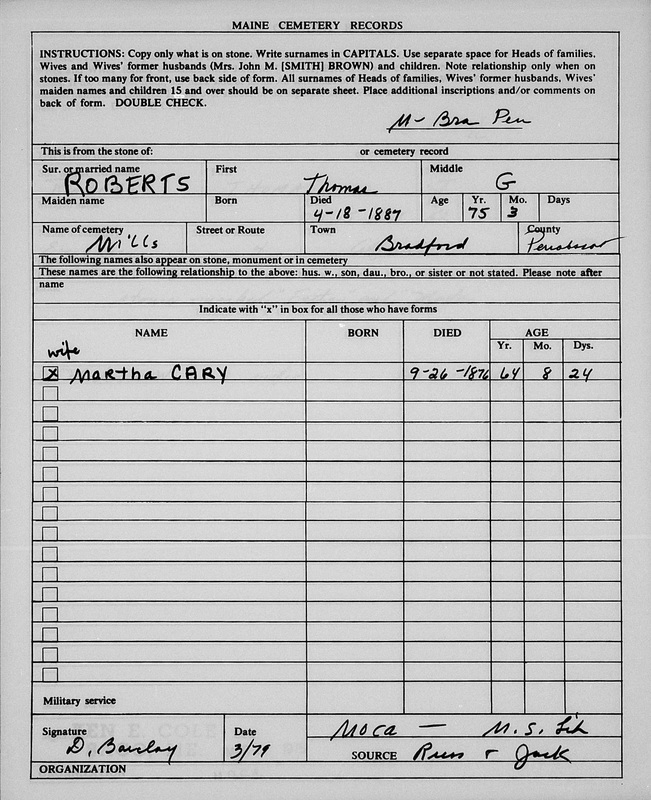 10th census, 1880 federal population census, Washington, District of Columbia: National Archives and Records Service, ([19--]) , FHL Film 1254768; National Archives Film T9-0768; Page 286C. As of after November 27, 1845, Levi Cary lived at Conway, Massachusetts. Patron submitted forms, IGI reference to Patron sheets, 1969-1991, Salt Lake City: Filmed by the Genealogical Society of Utah, (1970-1991) , Batch number: 8581704, Source Call No. 1396085, Sheet: 38. Church of Jesus Christ of Latter-day Saints. Logan Temple, IGI reference to Sealings of children to parents, 1884-1943; heir indexes, 1884-1943, Salt Lake City: Filmed by the Genealogical Society of Utah, (1958) , Film Number: 178099, Page Number: 246, Reference Number: 26235. Massachusetts Vital Records, 1841-1910, , Vol: 90 ; Page: 261. Massachusetts Vital Records, 1841-1910, , Vol: 168 ; Page: 265. Massachusetts Vital Records, 1841-1910, , Vol: 400 ; Page: 114. Seth C. Cary, John Cary, the Plymouth pilgrim, Boston, Massachusetts: (1911) , p. 128, section 72. J. H. Temple, History of North Brookfield, Massachusetts: Preceded by an Account of Old Quabaug, Indian and English Occupation, 1647-1676; Brookfield Records, 1686-1783, , at https://books.google.com/books?id=Aj0vGKe_JegC . The Town of North Brookfield, (1887) , p. 550. Find A Grave Memorial# 130619103. She was the daughter of James Cary and Hannah Alden. Vital Records of Brockton Massachusetts to the year 1850, , at https://archive.org/details/vitalrecordsofbr00broc . Boston, Mass. : New England Genealogical Historic Society at the charge of the Eddy Town-Record Fund, (1911) , p. 336. 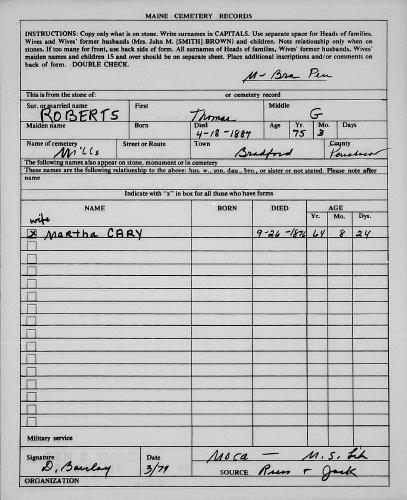 "United States Census, 1860", database with images, FamilySearch (https://familysearch.org/ark:/61903/1:1:MW63-M6R : 30 December 2015), Phoebe Cary in entry for Ransom T Cary, 1860. 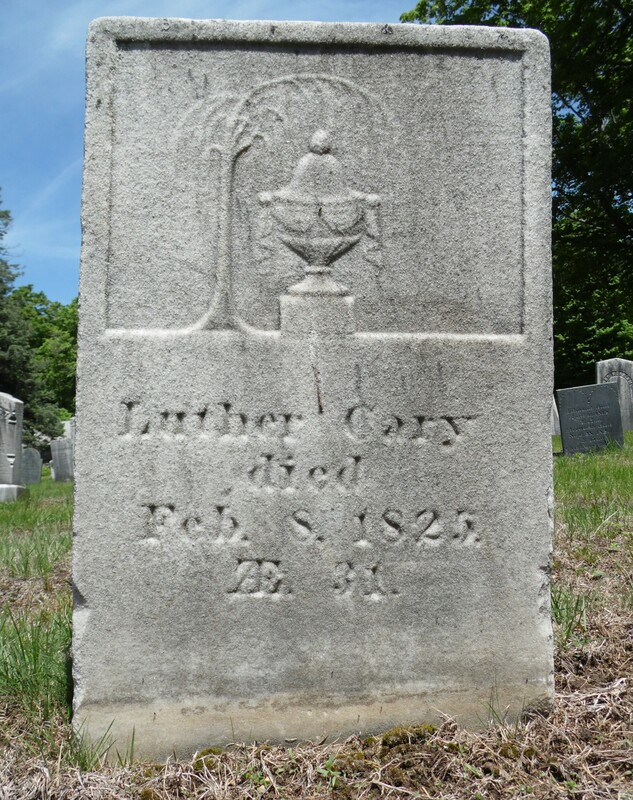 "Vermont Vital Records, 1760-1954," database with images, FamilySearch (https://familysearch.org/ark:/61903/1:1:XFJ9-N5Q : 6 December 2014), Lyman Henry Cary, 05 Nov 1825, Birth; State Capitol Building, Montpelier; FHL microfilm 27,502. Seth C. Cary, John Cary, the Plymouth pilgrim, , at https://books.google.com/books?id=oDgcAAAAYAAJ . Boston, Massachusetts: (1911) , pp. 176-8. Martha Cary was born on January 2, 1810 in Buckfield, Oxford County, Maine. She was the daughter of Col. Simeon Cary and Mary Howard. Vital Records of Brockton Massachusetts to the year 1850, , at https://archive.org/details/vitalrecordsofbr00broc . Boston, Mass. : New England Genealogical Historic Society at the charge of the Eddy Town-Record Fund, (1911) , p. 28, citing private record, from a descriptive catalogue of the members of the South Congregational Church of Campobello. At the time this book was published, it was in the possession of and compiled by Warren T. Copeland of Brockton. Bradford Kingman, History of North Bridgewater, Plymouth County, Massachusetts, from its first settlement to the present time, , at https://books.google.com/books?id=B-tHAQAAMAAJ . Boston: Published by the author, (1866) , p. 553. Seth C. Cary, John Cary, the Plymouth pilgrim, , at https://books.google.com/books?id=oDgcAAAAYAAJ . Boston, Massachusetts: (1911) , p. 130, section 78. Grenville Mellen Dodge, Norwich University, 1819-1911; her history, her graduates, her roll of honor, Montpelier, Vt.: The Capitol City Press, (1911) , Vol. 2, p. 474. "Massachusetts Marriages, 1841-1915," database with images, FamilySearch (https://familysearch.org/ark:/61903/1:1:NWBS-YFX : 17 February 2016), Stephen A. Scripture and Martha M. Carey, 30 Apr 1868; citing , Waltham, Massachusetts, United States, State Archives, Boston; FHL microfilm 1,433,026. Vital Records of East Bridgewater, Massachusetts, to the year 1850, , at https://archive.org/details/vitalrecordsofea00eas . Boston, Mass. : New England Genealogical Historic Society at the charge of the Eddy Town-Record Fund, (1917) , p. 36. Vital records of Bridgewater, Massachusetts, to the year 1850, Boston, Massachusetts: New England Historic Genealogical Society, (1916) , p. 69. Vital records of Bridgewater, Massachusetts, to the year 1850, Boston, Massachusetts: New England Historic Genealogical Society, (1916) , p. 36. Mary Cary was born in 1758. Seth C. Cary, John Cary, the Plymouth Pilgrim (n.p. : Seth C. Cary, Dorchester Center, Boston, MA, 1911, unknown publish date), p. 92, section 36.